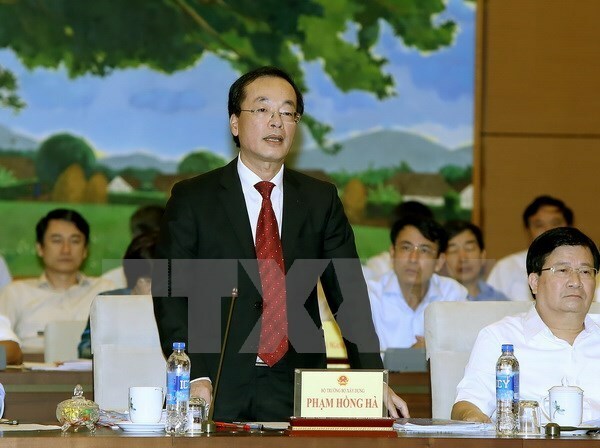 Hanoi (VNA) – Minister of Construction Tran Hong Ha admitted that there remain many shortcomings in urban planning while fielding questions raised by National Assembly (NA) deputies at the ongoing 13th session of the NA Standing Committee on August 16. Opening the question and answer (Q&A) meeting, NA Chairwoman Nguyen Thi Kim Ngan underlined outstanding problems in construction planning, urban architecture and urban land use issues, stressing that they need to be addressed in a synchronous and effective manner. Deputies said most urban areas face environmental pollution, poor water drainage and waste treatment, not to mention serious traffic jams, lack of relaxing space and violations of construction planning. They urged the minister to present solutions to the problems and questioned about the responsibilities of the ministry in guiding and inspecting the construction work in localities. Responding to deputies’ queries, Minister Ha acknowledged low-quality urban planning and sluggish implementation of planning, attributing that fact to state agencies’ poor performance and lack of information transparency. Meanwhile, inspection and violation handling remain lax, resulting in such consequences as traffic congestion and illegal land encroachment. He admitted that his ministry is to be blamed for urban infrastructure technical standards not matching the country’s development conditions, complicated procedures for urban planning, and irregular inspection that has led to slow detection of shortcomings. The Ministry of Construction (MoC) will continue advising the Government and the NA in fine-tuning relevant regulations, thus improving the quality of and preventing wastefulness in planning. He said the ministry will overhaul relevant standards to eliminate unnecessary, overlapping and contradictory procedures. Meanwhile, coordination with localities will be enhanced to monitor the implementation of planning, thus preventing arbitrary adjustment of planning and interest groups’ profiteering. When asked about illegal construction and public land encroachment, Ha agreed that the problem remains serious and noted it is very difficult to promise to put an end to illegal construction. This problem needs synchronous and close coordination among sectors and agencies from the central and local levels. The MoC will step up inspection and examination in the time ahead, especially at some projects using large areas of land, the official added. At the meeting, Deputy Prime Minister Trinh Dinh Dung said the Government will overhaul regulations on urban planning and urban development management, including the Law on Construction. It will also speed up the formation of satellite urban areas surrounding big cities like Hanoi and Ho Chi Minh City so as to ease pressure on big cities.